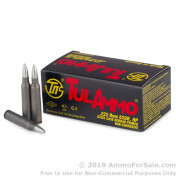 223 ammo for sale comes in a variety of weights and bullet types for American civilian shooters. 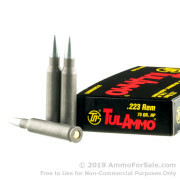 We're proud to offer both FMJ (full metal jacket) rounds and JHP (jacketed hollow point) and other projectiles for your 223 ammunition needs manufactured by some of the top companies in the world. 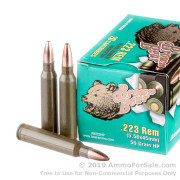 223 rem is a sporting rifle cartridge that is widely used in two main types of rifles: varmint rifles and semi-automatic rifles, such as the AR-15 and the Ruger Mini-14. If you know what you'll be shooting, you'll be able to make a better decision about whether you want to fire a lighter 55 grain bullet designed for varmint hunting or the heavier 62 gr round. Never had a jam with it, keeps shooting, and makes for good cheap fun! Other places charge around $130, so you're getting a good dollar value, too. Innawoods on 300 Rounds of 55gr FMJ .223 Ammo by Remington Ammo. 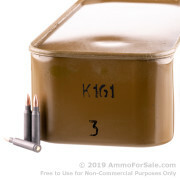 Kilgore on 1000 Rounds of 55gr FMJBT .223 Ammo by PMC Ammo. Never had a jam or misfire. Always loads and ejects without issue. 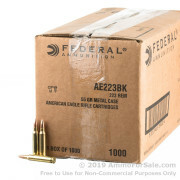 I am a big fan of American Eagle and Federal ammunition. 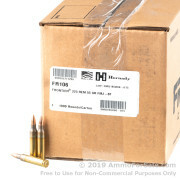 Jim on 500 Rounds of 55gr FMJ .223 Ammo by Federal Ammo. 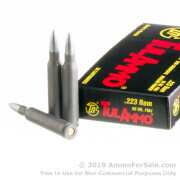 .223 Ammunition: What's So Awesome About It? The .223 Remington is one of the most commonly used rifle cartridges in America because of its low recoil and its cheap per round cost. The dimensions of the cartridge are very similar to the 5.56×45mm NATO military rifle cartridge. 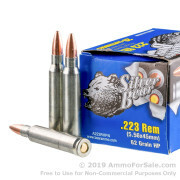 The cartridge is generally pronounced as two-twenty-three Remington, however, it is sometimes called two-two-three as well. 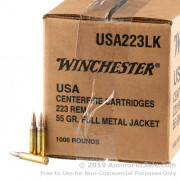 Most 223 ammunition for sale is loaded with a jacketed bullet that is 0.224-inch in diameter, with bullet weights typically offered in either 55 grain or 62 grain. 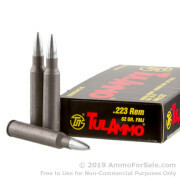 When the 223 cartridge is loaded with any bullet that can tumble, expand, or fragment in human tissue, the cartridge can deliver drastic terminal performance and stopping power, even causing hydrostatic shock. 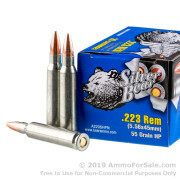 Essentially, these rounds are an improved and higher-velocity version of the 222 Remington, which was a varmint cartridge introduced back in 1950. 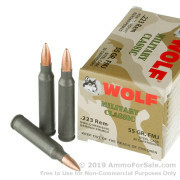 223 ammo was originally created specifically for a variation of the AR-15, which later became the M16, used by NATO-aligned militaries all over the world. Although the external dimensions of the 223 Remington and the NATO 5.56×45mm are extremely similar, they do differ in both chamber shape and maximum pressure. 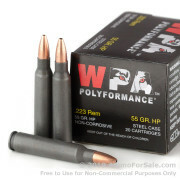 The mean and maximum pressures for some versions of the 5.56mm exceed the maximums of 223 ammo for sale. 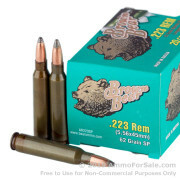 The 223 Remington cartridge has a 1.87 ml cartridge case capacity. 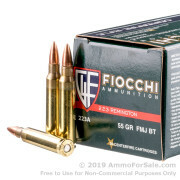 Although the 223 Remington ammo can be fired in a 5.56 mm chamber successfully and safely, trying to do the opposite (firing 5.56mm ammo in a 223 Remington chamber) may cause unsafe excessive pressures due to the shorter throat. 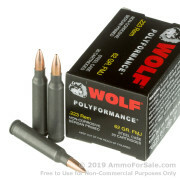 The specifications of the 5.56mm chamber have changed somewhat since its original adoption, and the military loading currently being utilized uses heavier, longer bullets than the previous loadings did. Thus, the throat of the 5.56mm chamber has been lengthened to accommodate the size of these bullets. 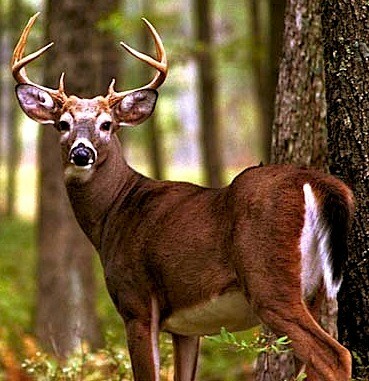 Semi-automatic rifles are frequently used for home defense, law enforcement, varmint hunting. 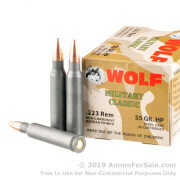 The 223 ammo on sale today is one of the least expensive high power centerfire rifle cartridges, and it is often used by target shooters and hunters worldwide. 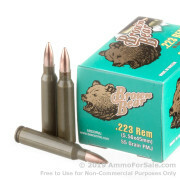 The 223 Remington cartridge has been synonymous with quality ammunition for high powered rifles since its creation. 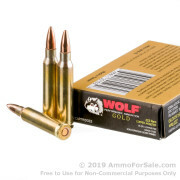 Anyone looking for a decent rifle cartridge should consider 223 ammo . 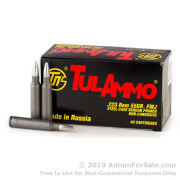 Full Metal Jacket (FMJ) Bullets: Popular for range use. A full metal jacket bullet usually has a soft core made of lead that is encased in a harder metal. The jacket provides for fast muzzle velocity but the projectile offers little to no expansion upon impact with a target. That lack of expansion makes FMJ bullets less than ideal for self-defense or lethal shooting situations. 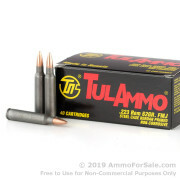 Full Metal Jacket Boat Tail (FMJBT) Bullets: Like the standard full metal jacket bullet, a FMJ Boat Tail .223 projectile has a hard metal encased bullet that is capable of very fast muzzle velocities. The difference lies in the boat tail design, which was created to aerodynamically improve the bullet's performance. The streamlined base of the FMJBT round should provide a more consistent shooting experience than the FMJ counterpart. 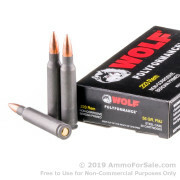 Jacketed Hollow Point (JHP) Bullets: Unlike full metal jacket rounds, hollow points are designed to expand upon impact, disrupting a maximum amount of tissue as it enters an animal or other target. This expansion allows for decreased penetration inside a target as well, making jacketed hollow point rounds a better choice than FMJ for self-defense, especially in home self-defense situations where a projectile could theoretically travel through a target and harm innocent bystanders. 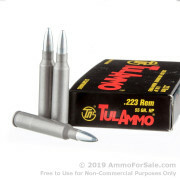 Soft Point Bullets: These .223 bullets typically offer a copper or brass jacket left open at the tip, which exposes lead and can lead to some expansion upon impact with a target. In military use, many shooters have found soft point rounds lead to more consistent performance than hollow point rounds because some military firearms were designed to use full metal rounds exclusively. Fusion .223 Bullets: Federal introduced Fusion .223 rounds in 2005 as the first ammunition specifically made for whitetail deer hunting. The rounds feature an inseparable jacket for increased weight retention and great expansion upon impact. Fusion is a proprietary design you'll find in Federal ammunition. 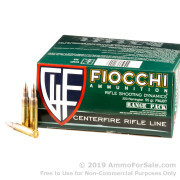 Many shooters who fire their .223 chambered firearms, like an AR-15, at indoor ranges will want to pay special attention to the projectile loaded in each variety of ammunition. As you may know, many indoor ranges require that all rounds not be magnetic. Because of these rules, many varieties of .223 ammo for sale are not acceptable for use at these ranges. Instead of a steel projectile, you'll want to find a bullet made from lead, which is not magnetic and perfect for indoor use. 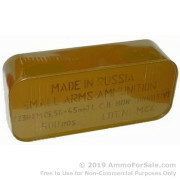 Also, note ammunition produced by reliable manufacturers such as Tula feature projectiles with a bi-metal jacket. This jacket is typically composed of steel and copper. That steel is considered magnetic. On the other hand, most 55 grain .223 ammo is non-magnetic. 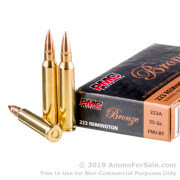 A good example of a non-magnetic ammo with a lead-core that would be great at most indoor ranges is PMC Bronze .223 ammunition.